Will Sartain strikes again. 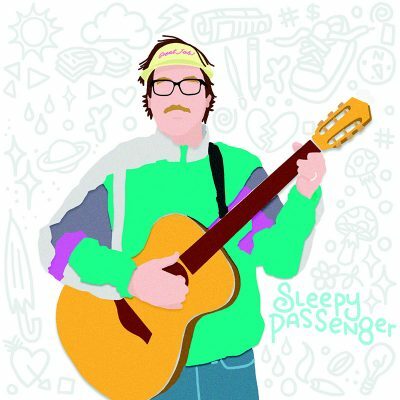 The name of his newest project is Sleepy Passenger and he has released a self-titled, ten-track album, it’s pretty much fabulous. Other than his vocals on some tracks, I’m only slightly reminded of some of his stuff I followed back in the day, though the way I listen to music has changed just as much as the music itself has. Sleepy Passenger begins strong with a handful of dreamy pop songs that catch and hold. The opener, “I Hope to See You Soon,” is a great choice to bat leadoff and features the first of some killer vocal accompaniment from Felicia Anderton, who can be heard all over the first half of the album. “I Can’t Get Off This Trip” follows up nicely, slowing the tempo and turning up the ambient atmosphere a touch. The engaging introduction to the album doesn’t quit there, either “The Stars Come Out” and the straightforward, disarming “Davey” are superb, with the former being a perfect candidate for a single, if there were one. The latter half of the album is just as stellar. Continuing with my favorite, “Brother Oh Brother,” Sartain gets down with some exceptional poetry, that’s exquisitely vivid and meaningfully ambiguous at the same time. “Let You Down,” another powerful gem, features an additional bout of solid songwriting as well as the aforementioned backup vocals, which certainly play a part in the shape the album takes when all is said and done.